Thousands of women lose their life to ovarian cancer every year. 2 in 100 women develop ovarian cancer. A major component of talcum powder is associated with cancer. Talcum powder is in many household goods including several feminine hygiene products. Want to Know More About the Link Between Talcum Powder and Ovarian Cancer? Tens of thousands of women are diagnosed with ovarian cancer every year. A little over ten thousand women die of ovarian cancer every year. A little over ten percent of all women with ovarian cancer detect it in its earliest stages. In relation to other types of cancer, it is the eighth most common form for women. A woman has about a two percent chance of developing ovarian cancer. A woman has about a one percent chance of dying from ovarian cancer. The median age for developing ovarian cancer is in the early sixties. Woman most vulnerable to ovarian cancer are over fifty five. The chances of survival for woman with ovarian cancer after five years is a little under fifty percent. Talcum powder is used in many personal hygiene products to prevent rashes and excessive moisture buildup. Talcum powder is commonly used in such goods as baby powder and female cosmetics. Talcum powder is normally made of the mineral talc. Besides talcum powder, talc is typically found chalks, oils, as well as food and paper goods. When making talcum powder, manufacturers extract talc from rocks in mines, pulverize it, and process it down to fine, powder form. The natural deposits of talc often sit next deposits of asbestos. The makeup of talc, when used in talcum powder, makes it useful for soaking up moisture and reducing chafing across the body. Naturally, talc is a soft mineral with a fine texture and light color. Talc's natural smell makes it a common component of many cosmetic and fragrance products. Manufacturers also use talc and talcum powder in household cleaning supplies. Research and critics reports that prolonged exposure and ingestion into the body could cause cancer or other injuries. Many manufacturers substitute talc and talcum powder in commonly used hygiene, feminine, and cleaning items. One of the most popular uses for talcum powder is to prevent the rise and spread of rashes on babies. Johnson & Johnson is one of the largest producers of talcum powder products. Rosenfeld Injury Lawyers LLC knows that many people are just learning about the links between talcum powder and ovarian cancer. That is why we are meeting with people every day so that they know the risks that these products pose to their health. 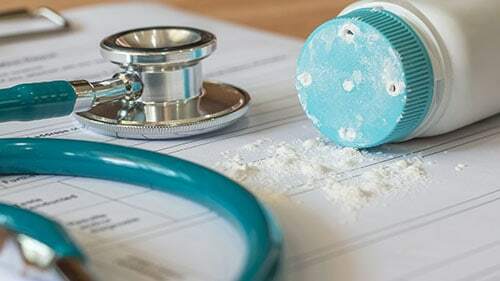 If you have used talcum powder and are experiencing symptoms of poor health, then you may be able to bring suit for damages and Rosenfeld Injury Lawyers LLC can make sure that you get all the recovery that you deserve.